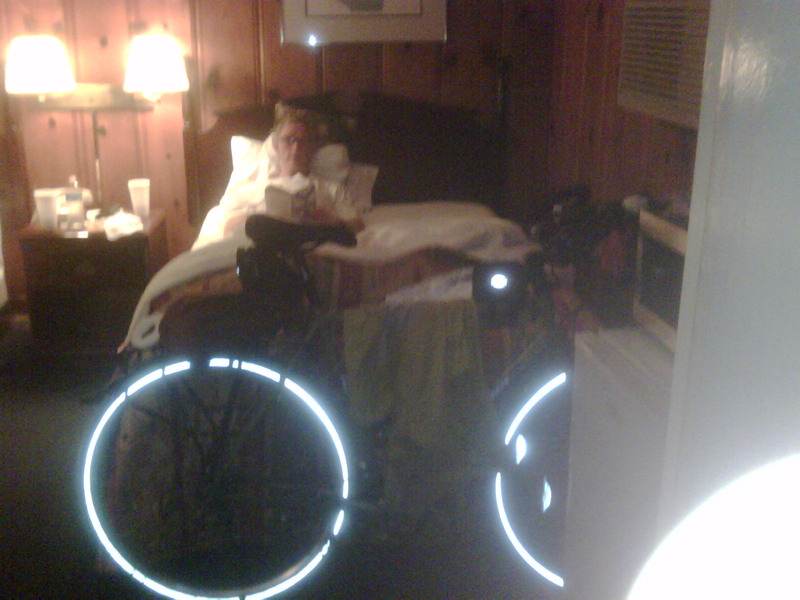 We did a poor job taking pictures today so this is Tom (and his bike) resting, reading, and listening to TV in our sumptuous room. We ordered pizza from the gas station across the street and ate it in the room. Nothing but the best! 57.23 miles today with a constant headwind, but it wasn’t so bad. I guess we’re getting stronger, and the wind was nothing like last Sunday. 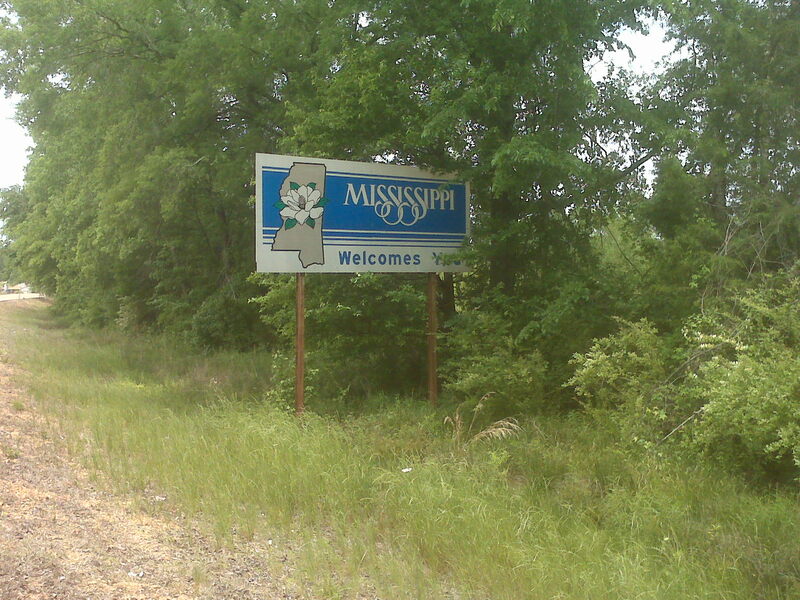 We had also thought it was 67 miles to Aliceville, so 57 was a pleasant surprise. The whole ride today was on pleasant, low- traffic back roads, marred only by poor surfaces, which can really take a toll. One of the notable things about today’s ride is that we rode the entire thing as I had mapped it, and it all worked! There are lots of wildflowers in bloom, beautiful but wreaking havoc with Tom’s eyes and nose. He’s been taking Benadryl Allergy each day, which works well, but we think it is upsetting his stomach. Seems like there’s no middle ground. He’s back to wearing a mask, which really works but is of course not very comfortable. We had intended to take tomorrow off, but that would leave us in Aliceville, which is a small, depressed and depressing town, so we’re going to move on. We’ll ride to Columbus, Mississippi (Mississippi!) tomorrow, which is only about 32 miles, and spend two nights there. It is a much bigger town, apparently the home of Mississippi University for Women, and we’re springing for a nicer motel there. Aliceville, despite being a dump, has special significance for us. For one thing, we finally headed north today, so every mile feels like real progress. The entire route to this point has been to get us here. Tomorrow we start what I’ve been calling Leg 2 of the trip, which is the 550 miles of the “Underground Railroad Route” mapped by the Adventure Cycling Association. Hundreds of cyclists have used these mapped routes, so I’m thinking the roads will have less surprises than the ones I chose. The weather was much cooler today and supposed to be cooler still tomorrow. Tom is much happier. I understand it actually snowed a little at Torch Lake last night-you guys up there need to warm things up before we get there! Happy Mother’s Day to all you mothers out there! My day was excellent. My best gift from Tom is that he is here on this crazy endeavor with me. We can’t be with our kids, but they’re both doing happy, productive things today and they’re in close touch with us. I feel very blessed. 37 miles today against a headwind, with mediocre road surface. But it got us into Columbus, which, while not a mecca, is, at 25,000 people, about ten times the size of Aliceville (which is now SO yesterday). We can’t seem to identify a viable local industry here, but one of the top available jobs is for physical therapists, so if the bikes break down here, maybe I can find employment! Another small victory is that we are finally a little north of our starting latitude in Peachtree City. We floated in the indoor heated pool, cleaned up and walked around for a few minutes before going to dinner at a good restaurant. Done at 8:30, back in the room and ready for bed. It feels so good just to lie down! Tomorrow is an off day, and we hope to rest up and be ready to conquer Mississippi. We’re still near the Tombigbee River, although we can’t see it. No picture today, as it would just have been Columbus in the rain. Since today is a rest day there isn’t as much to tell, so I thought I’d talk about some general things regarding the ride, and address some questions people have asked. Overall, we feel we prepared well for the trip. Our equipment is performing extremely well. We’ve had no mechanical breakdowns (I won’t list the possibilities individually for fear of jinxing us!) – the worst that has happened is one of my water bottle cages has broken and Tom has it secured with twist ties, and one of his toe clips (cage type) has broken. We can work with those. I have about worn through my cycling gloves and will soon need a new pair. Tom doesn’t wear his, so I can use those until we find a bike shop, which is actually very uncommon on our route. Physically, you’ve heard all about Tom’s allergy problems. He feels much better now that he’s been off of the Benedryl for a few days. Stomach pain and upset are gone and he just feels more like himself. We have eye drops, Fran Godwin suggested Zyrtec, which we have as a backup, and we bought a new supply of masks. Hopefully the allergens will change as we go north. We will actually be moving north a little faster than the season change, so we may get a little ahead of the late spring pollens. Of course there may be something different and just as bad as we go. Most people expected our legs and rear ends to be hit hardest by the demands of cycling, but that has not been the case. Again, at the risk of jinxing us, I hesitate to say this, but our legs are doing very well, and Tom has had no saddle issues at all. I have had some chafing, but I think I have that under control. All I have to say about that is that I couldn’t do this without the product called Glide, which runners use to prevent chafing. It goes on like a solid deodorant, and I don’t know what it is, but it certainly works! I haven’t mentioned it before, but Tom is actually having quite a bit of trouble with his left shoulder, pain and spasm in his upper trapezius. It started in Alabama when we had long days with lots of flat riding. Flat riding is not easy, at least not for me, like most people would think. There’s little opportunity to change position or cycling cadence, or to use a variety of muscle groups. The constant static posture is very fatiguing, and leads to imbalances between muscle groups and overuse by some. Sorry, that’s the physical therapist in me talking. Anyway, he does better when pulling on uphills, and I think we may be out of the real flat riding area, so maybe it will be better. We’ve iced it, and yesterday he let me make a figure-8 wrap from an Ace bandage, to hold his shoulders back. The jury’s still out on the wrap, but we may try it again. Any of my PT friends out there, I’m open to suggestions. I think we’re also dealing with a worn-out rotator cuff. Another issue people expected us to have is aggressive dogs. We have not yet had any issues with a dog who meant us harm. There have been some interested dogs who came into the road, and they can do great harm just by getting under your wheels, but none have persisted to that point. We actually had one pit bull-mix run with us for a quarter mile the other day, just smiling and excited to be out there. No houses or people around, so no chance to deliver him home. Another day, we took a turn down a short street that turned out to be a dead end, and all five pit bull- mix dogs came out to greet us at the end, barking a lot but really just excited to see somebody. We had to stop to turn around, and they were not at all aggressive. I know this is not always the case, but so far we have fared well. Weather has also not been an issue while riding, except of course the @#$%&*?#@! headwinds. You know how we feel about those. We have so far avoided riding in any rain, although certainly we will encounter that at some point. Many of you know that I love riding in the rain, but Tom is not so crazy about it. I have to admit it’s not very inviting to ride all day in the rain, stopping, getting chilled, going back out… oh well, we’ll deal with that when it happens. We’re doing well with the clothes and supplies we packed. We seem to be able to carry what we have, and we don’t have a lot of extraneous “stuff”. After the first day, I abandoned the practice of washing clothes out in the sink each night. We seem to be able to access laundry facilities every 3 days, so the rule of “3 of each” for riding clothes is still working well. I want Bill Hooper to know that I have used my umbrella a lot, all day last Monday and a good bit today! He was watching us pack the bikes and commented that he’d never known anyone else to carry an umbrella on a bicycle trip. This one only weighs a few ounces, though, and I’ve been glad to have it. We entertain ourselves in the evening, what’s left of it, with e-mails, watching TV, and reading. I have Sudoku puzzles to keep me from getting senile, and I actually made us a Backgammon game with a paper “playing board” and foam squares for playing pieces, with real dice. We haven’t used that yet, so it may have been a wasted effort. We also have a miniature deck of cards, also unused as of yet. We actually have very little free time, by the time we shower, get dinner, etc. That does not mean we don’t have time to read your e-mails – we both get them on our phones, and we check at every rest stop during the day. It got real quiet there a few days ago and I was thinking maybe I should go to an every-other-day update, but I heard from a bunch of people today, so I guess I’ll continue the daily note. I just don’t want to be boring you! We keep the bikes in the room with us, and unload our panniers (saddle bags). The panniers we chose are just “dry bags” with tops that roll down and secure with straps. No pockets, just a big bag. I tend to dump mine out on the bed, then toss back in what I know I won’t need that night. Tom is much more selective about what he takes out, which just reflects our personalities in general. I have a few things that are not strictly necessary, like makeup, and a hairdryer about the size of a large pear. Just not willing to do without them. My hair is clean, but looks horrible most of the time. I’m wearing a baseball cap a lot! Enough rambling. 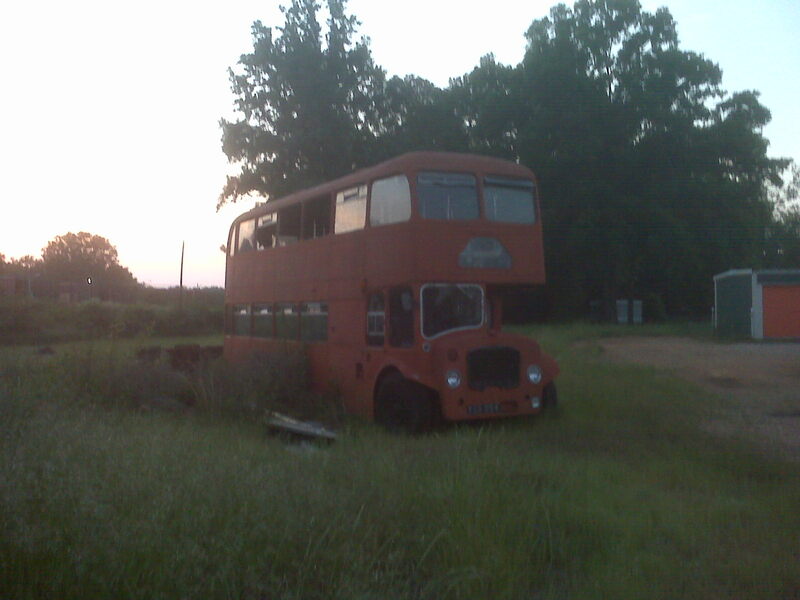 Tomorrow we head to Amory, MS., I think 50 something miles. It rained here today but is clearing and supposed to be hot again tomorrow. We think the wind might be swinging around to our backs. We can always hope! Remember when you were in like 3rd grade and thought it was really cool to spell M-i-s-s-i-s-s-i-p-p-i out loud? All those I’s and S’s just rolled off the tongue. It’s almost as much fun to type on the phone. But I digress. The wind did in fact swing around, and we had a constant tailwind today. YAY!! We really rolled for part of the day on a 4-lane road, and had some beautiful back roads as well. Our average today was 12.5, considerably higher than our usual 11.6 or so. The ride was marred only by the last 3 miles or so into Amory, which was on a totally inappropriate busy two lane highway. I have to say that so far I am disappointed in the Adventure Cycling routes – they seem to be much more OK than I am with these fast, busy two-lane roads. We found an alternate route for a good bit of the ride today-some of their route was great,and some not. I will keep an eye on things as we go, and try to make choices that will be safer and more pleasant. We felt great when we got here today and wanted to go on to the next town, but there was nowhere to stay. One B and B there but the phone just rang and rang. So we’re here in Amory, and we think we’ll be camping at Tishomingo State Park tomorrow night. We had a pleasant encounter today – our road north of Columbus led directly to the gates of the Air Force base there, when we thought it wound around it. We just pulled up near the guard house, parked the bikes, and walked over to talk to the guards. They were two friendly, interested, and helpful young people, a male and a female. We talked about our trip, and they offered us water and helped us figure out the best way to get around the base. It was a very pleasant stop. My friend Lynn Herrin e-mailed me today that we were on the front page today of “Today In Peachtree City”. It’s a short article about our trip, complete with that mediocre picture I sent out with the first e-mail. Our friend Kathy Gloer put the reporter in touch with us, and I talked to her for a few minutes yesterday. The article is really quite funny in parts, making us sound like we’re subsisting on McDonald’s gift cards! But most of it is very nice, and I shouldn’t argue with our two minutes of fame! Thumbs are wearing out. Hoping for more tailwinds tomorrow. Loved all those e-mails today! 67.36 miles (actually 63 but I made a run back out to the convenience store). Pretty nice tailwind most of the way. We chose backroads from Amory into Smithville, where we rested and reconnoitered and had a nice conversation with the local constabulary. I think he might have been the only policeman in Smithville. He was very friendly and very interested in our trip. We took a picture of him sitting in his car but he’s in the shadows. Took the dreaded hwy 25 from Smithville to Fulton as there didn’t appear to be a choice, and it was fine, very low traffic and an adequate shoulder. The shoulder and pavement change with the county, so you never know. We flew into Fulton on the tailwind feeling pretty good. Our friend Norma says we should get a bat cape to capture the wind. Had lunch and planned the afternoon, which somehow seemed like a lot more work than the morning, but it was fine. Thought we had a glitch in Fulton when we turned a corner and faced a detour sign telling us a bridge was out 12 miles ahead. It’s not an option for us to go 12 miles out only to have to come back and find another route. So we took ourselves off to the sheriff’s department to ask about the detour. We were assured that the bridge in question was only about a half mile out of town, and there was an easy alternate. I guess the “12 mile” sign was the only one they had. 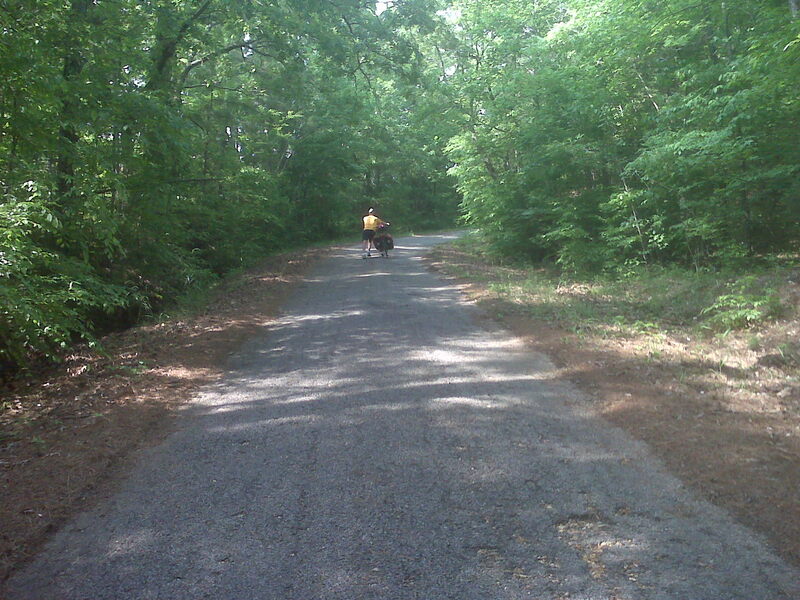 Once we worked our way through Fulton, we were on a pleasant rolling (actually a little hillier than that) 20 miles of rural road leading to the Natchez Trace. I’ve been looking forward to riding the Natchez Trace ever since I saw it was on the route, and it didn’t disappoint me. Peaceful, no commercial traffic allowed, undulating hills. Tom was worried it would be some funky old surface. We both enjoyed it, the only drawback being that we were only on it for ten miles. Much more detail about the actual route today, don’t know why. Long story short, it was a good day. Met friendly people everywhere we went. Tom’s shoulder is doing OK. It didn’t flare up yesterday so we’re hoping we can keep it under control. His allergies did very well in the morning and then he had to wear a mask in the afternoon. The picture is the view from the picnic table at our campsite, where we ate the bucket of chicken Tom carried on his bike all afternoon. (Much better than the beef jerky last time we camped.) 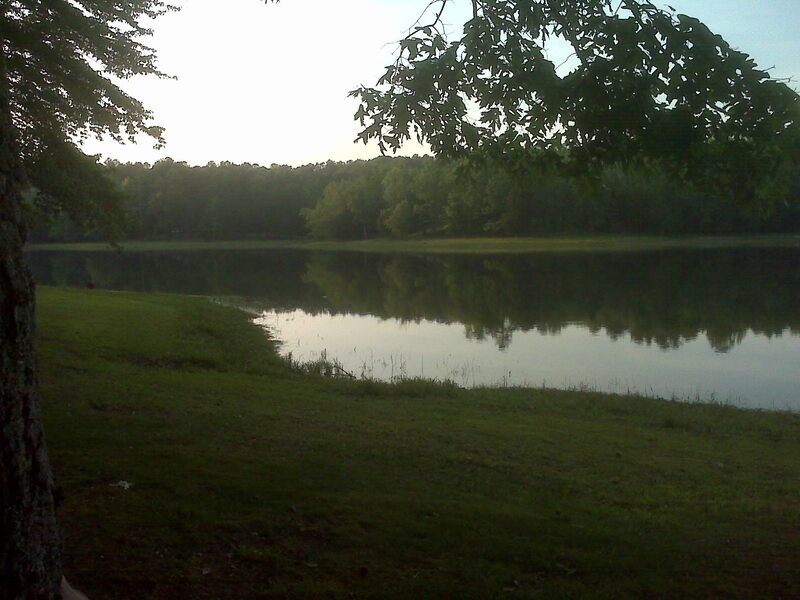 The campground is very peaceful except for the night peepers, bullfrogs, crickets, and now the morning birds. We have a very large duck that will eat out of your hand, and something four-footed took off with our Pringles container during the night. Camping is not convenient, and we’re doing it only when it’s the only accomodation within reach. But it has its charms, and certainly beats a sterile motel room for a change. Today we pass into Tennessee! We will go by the Shiloh Battlefield and plan to stay in a town called Crump. Reached another of our many landmarks yesterday – 500 miles! The picture looks idyllic, but that’s Tom up ahead of me pushing, not riding, his bike up a hill. We were so frustrated, the hill was so steep, and the pavement was so bad, I wasn’t even interested in riding up it. But I have to tell you, as heavy as our bikes are, it’s no picnic to push them either. And this was not the low point of the day. Anyway, it was a long day of pulling off the road when trucks passed, and of trying to find side roads, which were few. At this point we were also off of the atlas pages I brought, so totally dependent on Google Maps on the phone, and Tom’s GPS. The latter do not differentiate between paved and unpaved (or barely paved 75 years ago) roads. At one point we spent an hour going 3 miles on mostly unrideable dirt roads. But we’re here, and we rode the last few miles in on a great tailwind and low traffic (it was 6:30 in the evening, everyone else had gone home to supper!) We chose the no-name older, small motel across from the courthouse, because it puts us in closer walking distance to Main Street and some other stores. We are going to take tomorrow off (actually Friday, the day you will receive this). It’s a little sooner than I had planned, but we’ve had three long days in the heat. I have extra time built into the trip for unplanned off days as well as the planned ones. 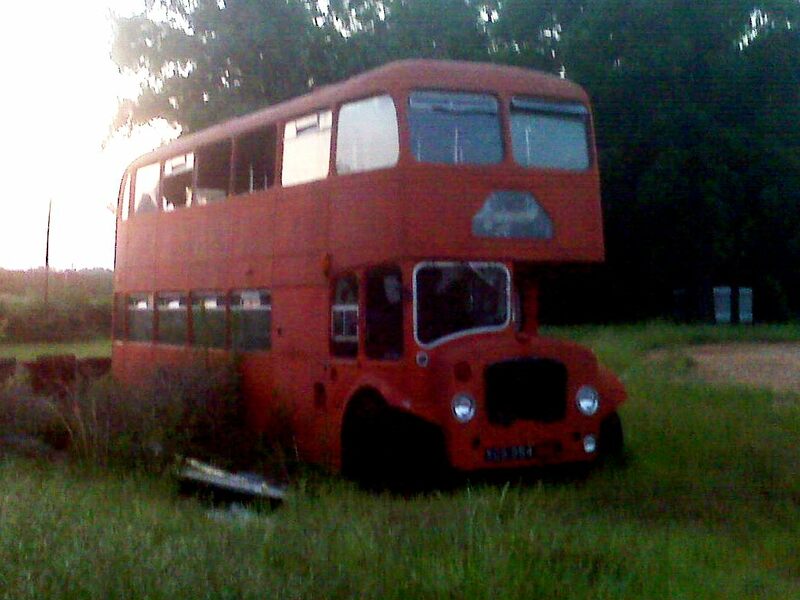 I had planned an off day in Perryville, our next stop, but I don’t think there’s anything there. We did cross into Tennessee yesterday but it wasn’t my happiest moment. Heavy traffic, bridge with no shoulder… But we are in Tennessee and have hopefully learned our lesson about taking state roads instead of a more rural route. Don’t mean to whine. There is, after all, a reason this is called ADVENTURE cycling! Hot today, which seems worse walking around than when we’re riding and creating our own breeze. We slept in, went to Huddle house for breakfast, and walked around to find a laundromat, grocery store, etc. A reporter at the Traverse City Record Eagle (our Michigan local newspaper, for those of you not familiar with the area) has gotten wind of our trip and was interested in talking to me, so we did a telephone interview from a park bench on Main Street. She was a delightful young lady and asked very good questions, so I’ll be interested to see what she comes up with. She said to look for an article on Sunday, May 23rd, in their weekly “Northern People” section. Some of you may want to skip this next part (boring, history and geography alert! ), but for you map junkies out there, it might be interesting. For days we’ve been near the Tombigbee River, then something called the Tenn-Tom waterway, and as we followed it we saw signs for many locks and dams, and passed many bodies of water labelled things like “Pool B”. 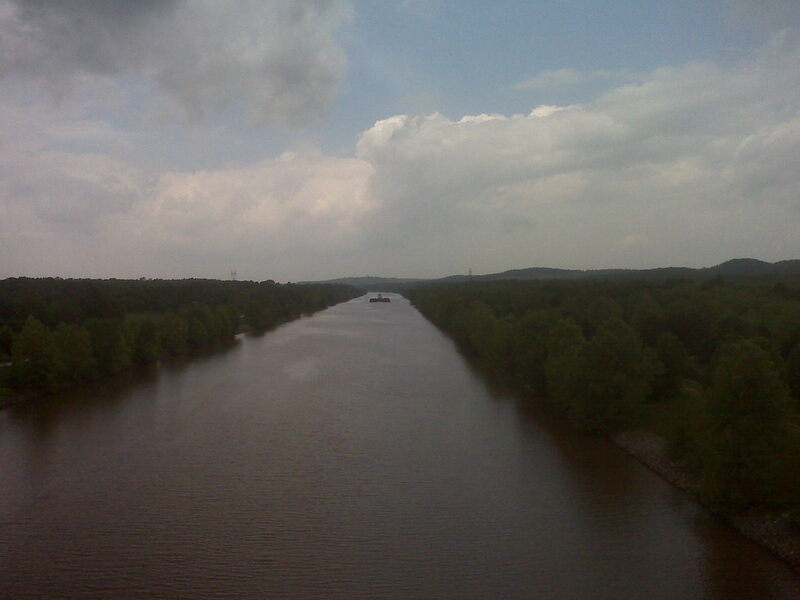 I finally looked it up today, and it is a 234 mile long artificial waterway built to connect the Tennessee River with the Tombigbee River. I guess that’s what makes it possible to navigate all the way down from, say, Knoxville, to the Gulf. There are 17 public ports and terminals along its course. It took 12 years to construct, and opened in January of 1985. Apparently there were some accusations of this being a pork barrel spending project at the time. I don’t know about that, but it is impressive to see. We passed over several sections of it yesterday – today’s picture is a barge coming down the waterway, taken from a bridge. We actually followed the entire length of the waterway, from where it ends at the Tombigbee and Black Warrior Lake in Demopolis, for five days to where it begins at Pickwick Lake and Dam on the Tennessee River. We will be very close to the course of the Tennessee River for many days now. One of the things we’re learning is how much the large rivers dictate the placement of the cities and towns, and limit the options of roads. Only larger roads span large rivers. This is pretty basic, but has really come home to us on this trip. Two things I meant to address on the last off-day. Are we tired of each other? Tom says no, and I say no also. This should be surprising, as we have been together almost every minute for the last two weeks. But we’re fine! Have we lost weight? We were wondering, but didn’t think so. Went into a menswear shop today and they had an old scale, the kind you used to put money in. We are both almost the exact same weight as when we left. All I can say is there is no justice in this world. About to go to dinner, so I will finish up. We found a nice little restaurant on the half block of viable old downtown, and plan to return there tonight. Friendly staff, cold beer, good menu. Forgot to mention yesterday that we’re one third of the way! I can make up some little milestone for almost any statistic. Way to go. We had an Art Rapids! meeting this am & Babs told me of your trek. Stan is still shaking his head in disbelief. We eagerly await your arrival “up north” but will follow your progress in the meantime. Thanks, Martha! We look forward to the summer too- we still want to go out to dinner with you and Stan! See, I think Friday the 13th just came on a Thursday this month. Wendi Wooten says I have raised whining to a creative art form. Maybe we can start a club.